My name is Kathleen and I’m really excited to join Dr. Dot’s team of amazing Massage Therapists. I have been working as an Holistic Wellbeing Therapist for the past 8 years. I’m trained in various types of massage, Remedial, Sports, Aromatherapy, Swedish and Hot-Stones. I also have extensive training in other alternative therapies such as Hypnotherapy, Reflexology, Reiki, Pilates, Qigong and Meditation. All training carried out in college/university accredited or with acclaimed Masters in their craft. I’m really looking forward to working with different energies as the past 5 years I’ve been specialising in people with Parkinson’s Disease and other serious health conditions, making this opportunity new and exciting. Massage is my favourite thing to do and I consider it my art. I love it so much I volunteer my time every week doing healing therapies for people who can’t afford regular price therapy. Getting hired by Dr. Dot feels like getting signed by a record label. It shows me that always bringing my A-Game to work has paid off as I get to work with people from all walks of life. Every day is different and full of potential to do good work. I look forward to working with you. This entry was posted in Dr. 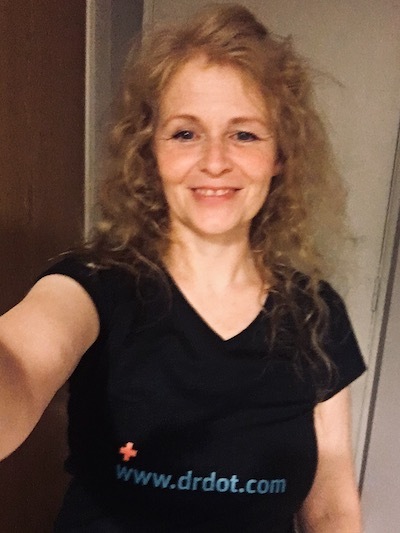 Dot and tagged 24-7, anytime, anywhere, backstage, blog, Deep Tissue, delivery, DR.Dot, edinburgh, female, glasgow, home, hotel, hypnotherapy, kathleen, massage, office, pilates, reflexology, reiki, scotland, service, studio, venue by Matty Davies. Bookmark the permalink.